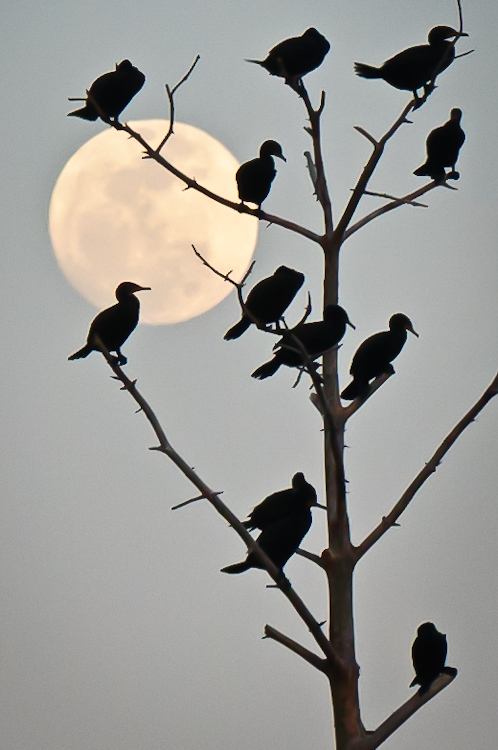 A series of critiques on the CNPA forum helped me fine-tune this image of the one-day-before-perigee moon framed by a tree filled with roosting cormorants. Selection of a composition with a cormorant outlined against the full moon and selective cropping to isolate the single tree helped make this a stronger image than the one I started with. That’s the power of C & C, I think, when comments and critique by others gives positive feedback. Makes us better photographers, and that’s why I choose to participate in the CNPA Image Critique forums. 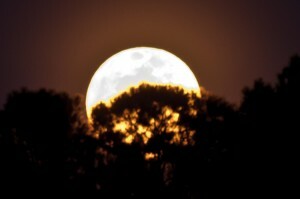 I also took a few shots of the perigee moon last night when it was truly full. We were visiting Nancy & Fred at Sun City HH so the best venue for viewing was across Lake Somerset, near their home in Sun City. We gathered there to wait for the moon to rise, guessing at which exact location the moon should appear. In general we were pretty good guessers, although we became impatient waiting for the moon to rise above the treeline across the lake. When we finally saw the moon through the trees we were indeed impressed with the size and brightness. The yellow glow through the trees seemed almost like a fire back-lighting the forest outline. It was breathtaking to watch that fiery ball rise, so quickly it seemed, through the trees and then above them to reveal the familiar details on that brightly-glowing surface. The anti-climactic view of the whole moon, alone in the clear sky with no reference point to establish size perspective, simply couldn’t compare with the drama of the moon rising through the trees. I hope that wherever you were you were able to watch this unfold! This entry was posted in Commentary, Landscape Photography. Bookmark the permalink.